"Oh, its flavors! They are the most haunting and brilliant and thrilling and subtle on the planet." So eulogized Miles in the 2004 cult-hit movie Sideways about that most magical, recalcitrant, frustrating and certainly most expensive of all red wines, Pinot Noir. As he goes to great pains to point out it is a difficult grape to grow, it isn't a survivor like Cabernet Sauvignon. It also produces low yields and is hard to ripen, at least in Burgundy, it's home territory, and often times results in thin, watery wine. However, if you grow Pinots where there's a abundant sunshine, like California, it's too easy to wind up with over-ripe grapes and sweet jammy wine that tastes like stewed fruit. In fact, over the years, I have wasted more money on disappointing Pinot Noir than any other type of wine. All too often the Burgundian version is either tightly wound, tannic and far from ready to drink, despite the simpering assurances of the sommelier. On this side of the Atlantic, you find Oregon Pinots, which can be austere and hollow, or the California versions which, as mentioned above, are more infused with flavors redolent of the nursery than the dining room. So why, might you sensibly ask, would any sane winemaker bother with this low-yielding, temperamental and risky grape, and why would a consumer with any sense of a dollar's value continue to pour good money after bad by ordering yet more Pinot? Well, the answer is very simple--when its good, when it's right--the results are, as Miles points out, sublime. That's the holy grail Pinot lovers are continually seeking, and why they stoically endure endless disappointments in the hope that they'll discover that rare, oh, so rare, bottle that is transcendently brilliant. Pinot's magic, it's irresistible charm, its occasional flashes of brilliance, is its ability to combine in one glass two seemingly mutually exclusive flavors. The first impression one gets of a good Pinot is its unique floral quality--again and again you hear descriptives like rose petals and violets applied to the wine. This is especially true of young Pinot, but as it gets older, other completely different flavors begin to develop--the deep, rich, earthy flavors of damp leaves, leather, cedar and Eastern spices. And it is the ability of the refined, delicate floral elements to not only coexist with, but to enhance the more robust, rustic flavors that makes Pinot so special--what Miles was raving about. Now, as you might imagine, such a complex wine, not to mention expensive, is not one to appeal to mass wine drinkers, and this is why Pinot is still very much a niche product, a connoisseur's wine. As Peter Morrell of the New York wine shop that bares his name explains, "If you asked ten wine professionals what their favorite red grape is, eight would answer P.N. If you asked ten consumers, two of them would answer P.N., maybe only one." I think he's being optimistic. ACNielsen, the world's largest collector of retail sales data, reports total U.S. sales of Pinot Noir in 2003, the latest year for which figures are available, were 1.7 million cases, compared to 26.7 million cases of Merlot and 21.7 million cases of Cabernet Sauvignon. This is not to say that the widely reported Sideways effect is not a reality. Nielsen adds that "while Pinot Noir sales have been on the rise for several years, the varietal has enjoyed especially strong sales since the movie's release." Pinot sales reached nearly 370,000 cases during the 12 weeks following the release of the movie, an increase of nearly 16% versus the same period a year earlier. More dramatically, sales of domestic Pinot increased by 18.2% during the same period, and sales of domestic Pinot in California, where the movie is set, increased by a whopping 34.8% during the same period. However, reports that sales of the frequently much maligned Merlot have plummeted as a result of Miles frequently expressed disdain for the varietal are not born out by the numbers. Several things surprised me as I tasted more than 100 different American Pinot Noirs for this article. The most encouraging was just how fabulous the best were, especially those from Oregon. They showed real elegant structure and the potential for great complexity with a bit of bottle age. And there's the rub--most of the current releases, 2003s, are still far too young and need time to develop. The California offerings, on the other hand were generally disappointing. They mostly appeared to be designed as aperitif wines--tipple for the "after work I'll have a glass of Pinot crowd"--and tasted like overcooked fruit. This was especially true of wines from Santa Barbara County, Sideways country. However, as Melissa Boardman, wine consultant at Morrell's, points out, "People who are just getting into PN will start with the more fruity, jammy, easy-drinking style from the Central Coast or the southern region, and there's also value there as well. It's easier to turn someone on to a $20 jammy Pinot from Santa Barbara than to sell them a complex $40 Oregon Pinot. For someone coming from Merlot to Pinot, you want to start them with the juicier stuff!" 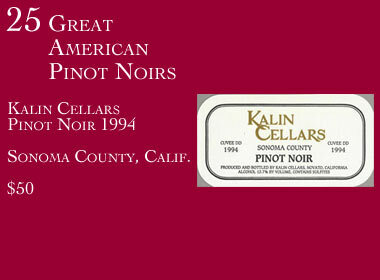 Now not all California Pinots were a disappointment; in fact several wonderful ones made it into the accompanying list. Rather, it's that these proved to be the exception rather than the rule: wines made from grapes grown in unusually cool vineyards by winemakers, who were intent on facing up to the challenge of crafting a great Pinot, rather than just another smooth, jammy California red. This also brings us to the subject of the difference between California and Oregon Pinots, and while it is difficult to generalize, I will anyway because everybody keeps asking the question. To put it simply, Oregon Pinots are more elegant and structured, they have an intellectual quality that appeals to the connoisseur, while the California versions tend to be softer, rounder and offer simpler, more visceral pleasures. There is more variety among American Pinots than any other varietal, and that is much of their fun. So arm yourself with the following recommendations of 25 American Pinots that we put together, and start experimenting. You are in for a host of surprises, most of them pleasant and, if you are lucky and run into that special Pinot Noir, a transcendent experience. In the world of California winemaking, where hype and promotion are often as important as what is in the bottle, Kalin Cellars really stands out. Or rather, it doesn't. As my colleague, Richard Nalley, at Forbes FYI, has pointed out, this is the best California winery you've never heard of. They do things a lot differently at Kalin. For instance, their current release Pinot is the 1994--this, at a time when their competitors are releasing the 2003s--and it is, quite literally, astounding. Hugely rich, powerful and intensely flavored, it displays amazing fresh-fruit accents for a wine so old, yet it is still tightly wound and could even use several more years aging. This is quintessentially a connoisseur's wine--that is that is if you can manage to snag a bottle from their minuscule production.